The Dodgers beat the Diamondbacks 8-0 because they are an unstoppable super team, at least until the next game when everybody freaks out again. At least for today, though, everything went according to plan. The MLB-leading home run producers again came through, with solo shots from Andre Ethier and Justin Turner, and a big grand slam from (who else?) 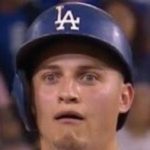 Joc Pederson. Scott Van Slyke‘s two-run single capped the offensive fireworks for the night. The grand slam wasn’t all Joc did, of course, as he continued his excellent defense that has reminded the Dodgers what a center fielder actually looks like. The shutout was a four-hit effort, combining Carlos Frias (5.1 IP), Pedro Baez (1.2 IP), Sergio Santos (1.0 IP) and J.P. Howell (1.0 IP). As a group, they only allowed seven baserunners and finished the game in 113 pitches. Speaking of Frias, he needs a rotation spot just for his plate appearances alone. Most importantly of all, the faces of Dre.